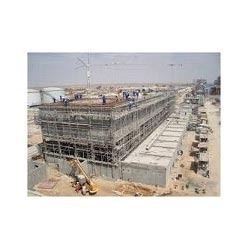 Along with fabrication services we also provide civil construction service. We have a labour force of 200 strong men who help us to finish any demanding job will very good results and with the deadline. We provide our clients with all the services and in very reasonable rate. We are the most reliable name in the industry for 20 years. We provide our customers with wide range of facilities like Designing, Testing, Fabrication, Civil Construction and Interior Designing services all under one roof. We are also manufacturers and suppliers of some of the key building construction products like various types of Concrete Blocks, Industrial Shed Sheeting material and Gypsum Boards and Metal Framing material. We provide our services with most reasonable rates. Our products are widely appreciated for their reliability, strength and aesthetics. We hope to continue serving our clients with the best products and with our knowledge and experience provide our customers the most satisfying results.